Video: Getting High With the FrankiesThe Frankies are smoking. And not in the barbecue sense. Frankies Cookbook to Drop in MayPeter Meehan collaborates with Frank Castronovo and Frank Falcinelli. Brown-bag It Like a Chef’s KidWhat chefs put in their kids’ lunch bags. Frankies Spuntino Launches a Second Coffee Shop, Spreads Stumptown GospelCafe Pedlar gets a new location on the Lower East Side. 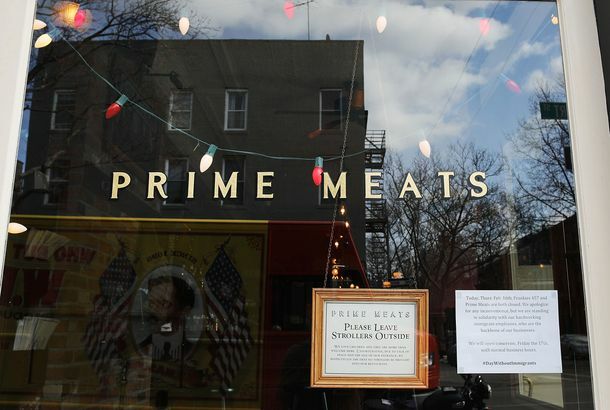 Prime Meats Bar Opens in Carroll GardensA first glimpse at the new throwback Frankies Spuntino project. Frankies UpsizesThe tiny Lower East Side Italian favorite is doubling in size. Coming Soon: ‘Edible Manhattan’We’ve been longtime fans of Edible Brooklyn, a very cool magazine we wrote about a while ago. Edible Brooklyn doesn’t publish restaurant news as much as articles and essays about the life of the borough’s food culture, written by the people who love it. And now Manhattan will get the same treatment in Edible Manhattan, which will come out bi-monthly starting in the fall and is already accepting subscribers. Carroll Gardens to Get ‘Fine Dining Without Being Fine Dining’Ryan Angulo, the talented chef de cuisine who has helped Chris Santos make Stanton Social such a hit, is taking his knives and heading off to make his own show in Carroll Gardens. The as-yet-unnamed restaurant will be going in to 458 Court Street, down the street* from Frankies 457 Spuntino, and aims to serve “upscale, well-developed food that’s still kind of casual…fine dining without being fine dining,” Angulo tells us, mentioning Prune, Frankies, and San Francisco’s Zuni Café as models for the kind of thing he wants to do. “We don’t want to price anybody out. We want to make sure to get the neighborhood clientele included.” The place is looking at a possible mid-March/early-April opening. *Correction: The original version of this item said Angulo’s restaurant would be across the street from Frankie’s 457. Celebrity Judges Wary of Hamptons Beach Burgers Dateline: Amagansett. The scene: Your typical summer share house. The occasion: The first annual Burger Bloodbath, a competition between three mere mortals to create the “best beach burger” on the Hamptons, as judged by three of New York’s most esteemed palates: Frank Falcinelli, co-owner of Frankies Spuntino , New York Times $25-and-under critic Peter Meehan (whose visage has been obscured to protected his dining anonymity), and David Chang, the downtown legend behind Momofuku and Ssäm Bar. Co-hosted by Hampton Style, Hamptons blog the Beach, and food blog Eater, the showdown was played for little more than sheer glory. Writer-Rocker Darcey Steinke Downs Jell-O With NunsIn her new memoir Easter Everywhere novelist Darcey Steinke recounts her life as a minister’s daughter, traveling the country and picking up tastes for regional dishes like fried okra. “When you get it right,” she says, “It’s like crack.” Though her Prospect Park neighborhood has yet to yield the perfect fix, she’s fond of the jerk chicken, and as a survey of her most recent week of eating reveals, she also knows where to find exceptional sauerbraten, redemptive sticky-toffee pudding, and a classic Waldorf salad with marshmallows — which she enjoyed with an order of nuns.